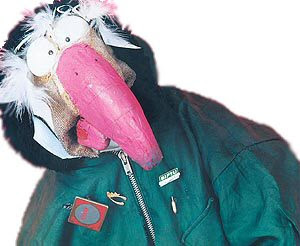 Dustin the Turkey is an Irish puppet, television presenter and star of RTÉ television's The Den since 1989. A turkey with a Dublin accent and strong language, Dustin is voiced by John Morrison, brother of Ciaran Morrison who was one of the creators of Zig and Zag. Dustin first appeared on The Den with Zig and Zag in 1990, but remained with the show after their 1994 departure to Channel 4. Dustin's achievements include a musical career with chart-topping singles. Dustin won the public vote to represent Ireland at the Eurovision Song Contest 2008 with the song Irelande Douze Points but failed to progress past the first semi-final stage. Originally the favourite to win, Dustin was chosen by the Irish viewers at Eurosong to represent Ireland in the 2008 Eurovision Song Contest, becoming the first puppet to do so. Though it was not announced on the Eurosong show how many votes Dustin won, an RTÉ radio show later revealed that the second place had an average of 15 points, while Dustin had 23, so the public really did want to send a puppet to Eurovision. Despite it being a public vote, there was a mixed reaction from the live studio audience when the result was announced, including many audible boos. A panellist on the programme, former Eurovision winner Dana, stated that Ireland would be better withdrawing from the competition than sending Dustin. Despite her lack of support, past Irish Eurovision entries Dickie Rock and Maxi stated their beliefs that Dustin could win. Dustin performed his song in the first semi-final on 20 May. The song contained, amongst other things, references to Riverdance (Give us another chance, we're sorry for Riverdance!) and Michael Flatley (Sure Flatley he's a yank). Dustin failed to progress beyond the Eurovision semi-final. Dustin has often declared his interest in politics. He has campaigned in two presidential elections. He competed as Dustin Hoffman in the 1997 presidential election as both forename and surname were necessary to register his Poultry Party. He also has shown interest in becoming the president of America. Dustin is a UNICEF ambassador. Dustin made a film titled Dustin in Fowl Play in 2002. In this film, he and his friend Snotser, put together a boyband called Mankind. Dustin was also the subject of the documentary Dustin: 20 Years a Pluckin'.